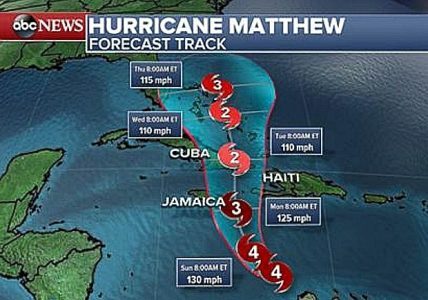 As Hurricane Matthew bears down on Florida the state’s airports were announcing closures as more than 2,500 flights have been cancelled from Wednesday through Friday. There have been more than 1,400 cancellations today alone and over 1,100 and counting for tomorrow. The most impacted airports were Miami International Airport and Fort Lauderdale-Hollywood International Airport, both of which plan to shut down today. Fort Lauderdale will halt operations at 10:30 a.m. with Miami to follow at noon. Orlando’s Sanford International Airport will cease domestic commercial flights at 10 a.m. EST Thursday. International commercial flights will cease at 6:30 p.m. Additionally, Amtrak temporarily suspended train services in the southern USA due to severe weather impacting the east coast of Florida. Officials advised travelers to check with their individual airlines, or Amtrak about travel plans. (ABC News, Fox News).